I’ve been doing all manual SMD assembly ever since I started Low Power Lab, and still do at this moment. I find it too hard to outsource assembly and too prone to some issues. Anyway, in the beginning there were tweezers, a microscope, and a toaster over for reflowing. I very quickly realized that the tweezer method was insane to put it mildly, the only worst thing that I can think of is actually soldering everything with a soldering iron instead of using paste. Nonetheless the first ever Moteino batch was tweezer-microscope+reflow assembled. Then I figured out how to make metal stencils out of soda cans. 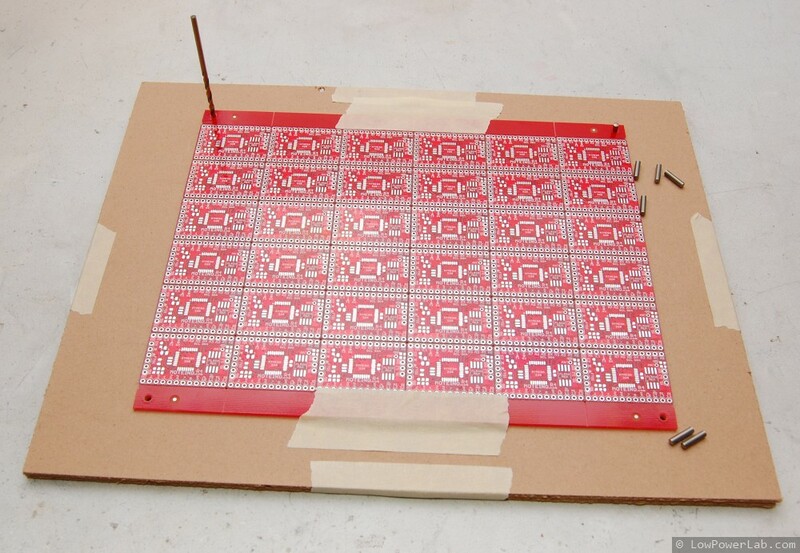 That works beautifully, costs next to nothing, and the more you make the faster and better it gets, and those stencils never wear out, unlike mylar or other plastic stencils. 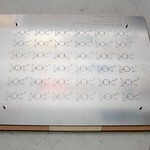 It’s the closest you will get to real stainless steel stencils. But I could only spread paste on 1 piece and it gets tedious, watch this video of how I actually do it. Panelizing PCBs sounded a bit scary. So finally I made the jump and panelized a batch of Moteinos recently. 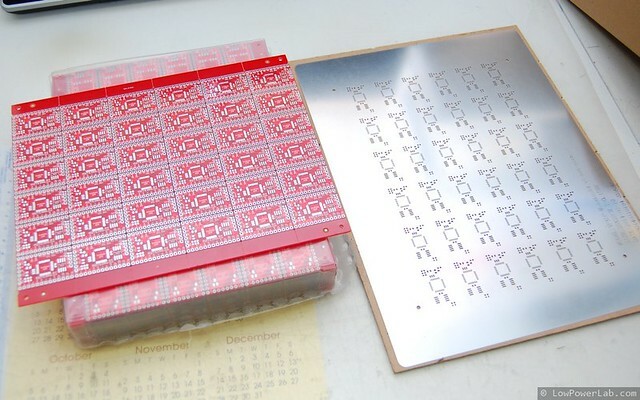 The panel has 2.5mm tooling holes that are spaced on a NxN cm grid (which would fit the Stencil8 tooling block), but quite frankly they could be spaced any way. 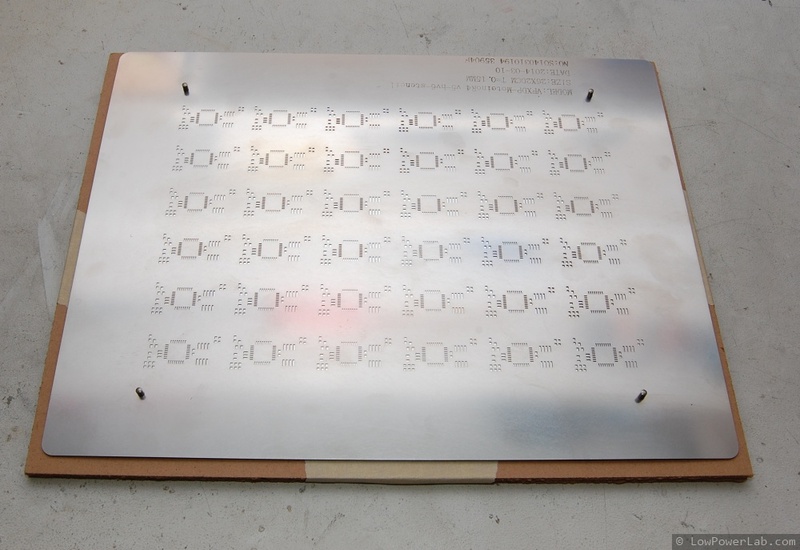 The tooling holes match holes in the stencil such that the stencil alings perfectly with the PCB. The panels and stencils are made at Hackvana. I don’t have a tooling block because quite frankly I don’t think it’s needed (UPDATE: I actually had a MDF block milled – see this post for details). I drilled holes in some MDF using a 2.5mm drill bit (the thin sheets that come with the stencil are right size and perfect for the job), using the PCB to pilot the holes. 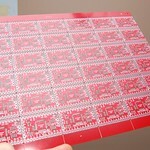 Then 2.5mm steel tooling pins align the stencil with the PCB. The time savings is significant, especially if multiple panels are assembled at once. 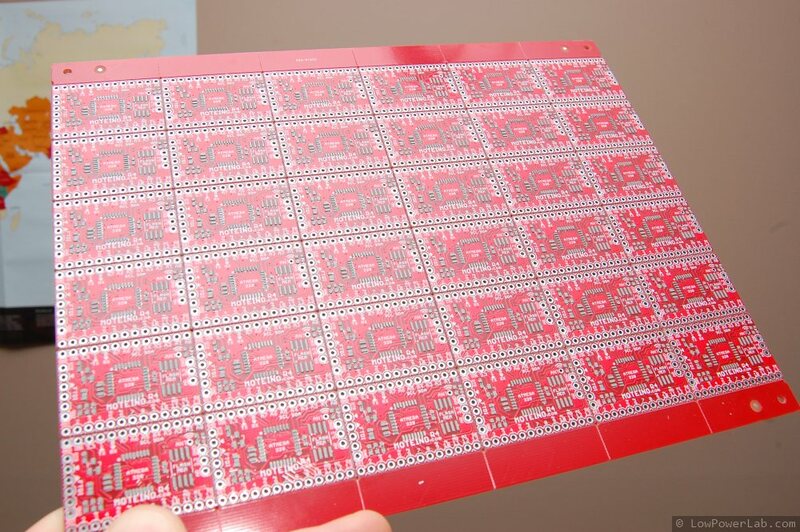 I was reluctant at first and I was worried about the spacing between the PCBs and other things like that. But glad I did it and this is a first step towards more serious in house assembly. The v-scoring means the PCBs are snapped apart after reflowing, and the edges will be a bit rougher than the nicely routed PCBs I was used to. I do however snap the panels in 3 rows for easier SMD assembly with my pick and place vacuum tool. 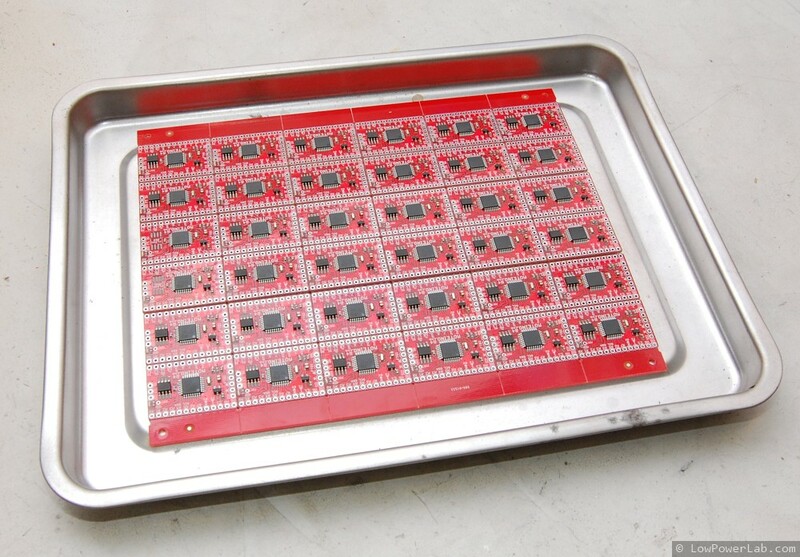 After reflow they are snapped into individual pieces. 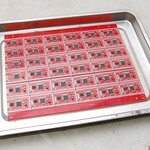 The panelization is done at the PCB fab for an extra fee. The McMasterCarr parts for the pins and the drill bit are: here for the pins and here for the drill bit. Next up: pick and place machine maybe? Haha. UPDATE: See the “definitive tutorial” post on how to make these. 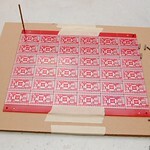 I posted this video of the latest SMD stencil I made for my Moteino project. I ended up shrinking the pads by 8mil on this one, the reason being that the previous stencils I made I shrunk by 5mil and the stencil would dump too much solder paste, causing some solder bridging. See the stencil step through post for details how to make this. I also discovered another very good method to transfer toner: silicone coated paper. I wiped a very thin layer of clear silicone on a blank sheet of paper (on half of it). After it dried I printed the mask directly to it. The iron method will give very good results, the toner will either transfer 100% or not at all. The spots where it doesn’t transfer are fixable with a thin Sharpie pen. The tool you use to spread the silicone has to be very flat and even, any unevenness will result in less perfect toner transfer.